We've been watching both on our site cameras and in person as the installers work their way around the house. When it gets done we'll share the movie with you. It looks pretty amazing, I must say. 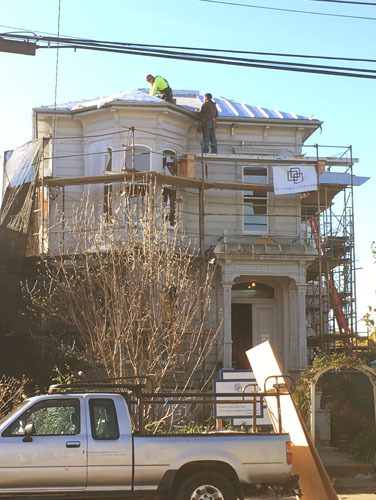 I've spent so many years in that house nursing the old roof through wet winter after wet winter that I am not sure what we will do with ourselves now. What will we do with our elaborate collection of buckets? I guess we can each choose a tub and take cold baths in the dark. I went to the house today to talk about a few things with the contractor: the stair paint colour, the side porch stairs, the glass shower partitions. And I got to admire the second tub in place. This is the deep soaking tub in the back bathroom. 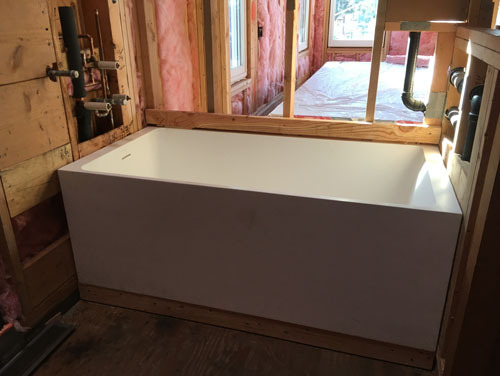 My original intent with this tub was to have it installed fully in the open to show it off, but after discussing the difficulty of waterproofing it with the contractor, we revised that and it will be given a little wall that can be waterproofed and a countertop material deck to finish it off. 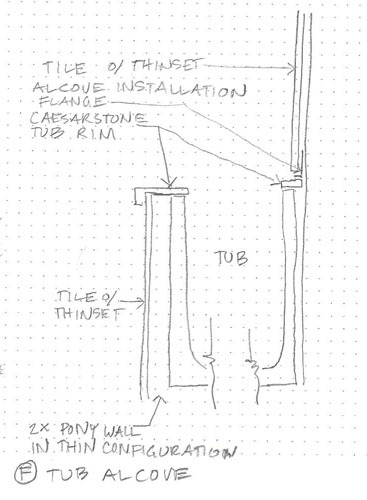 It's a much easier detail to build, and doesn't detract from the design of the shower and tub enclosure at all. This is the basic detail, without any waterproofing information. The contractor just made a big commitment to having all his guys learn the Schluter Kerdi system of waterproofing so that is what they will be using, and the details are very simple, so no detailed waterproofing information was necessary from me. It wasn't my intent to post a tiny little post every day this week, but that's how it is working out. We are going super fast trying to get a bunch of details nailed down and recorded before Christmas. Tomorrow we are meeting on site to talk about tile. In my old house, the tub was great to soak in because the end away from the faucets sloped exactly right. Not so with the tub in my current house. In the photo, it doesn't look like your tub has a slope at all? How is soaking going to work? There's a slope on the side you can't really see, away from the faucet end. The light makes it look not very sloped but it's enough.